Attitude! 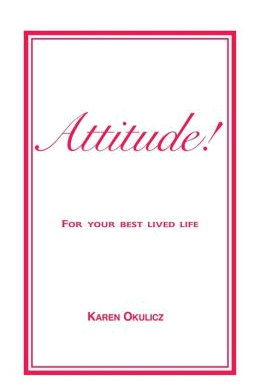 "For your best lived life"
How we view our world obviously has a lot to do with our attitude. We have all heard the old saying, "Do you see the glass as half-empty or half-full?" A way of looking at life as an optimist or a pessimist. Which do you choose? To look at life as the glass half-empty (negatively) or half-full (positively)? Moment to moment we choose the way we view our life. Mental views are similar to external views. We all have our favorite view of things or places. It could be a view of the ocean, or a mountain range, or a moonlit skyline. It would be wonderful if we had those views we choose all the time, but we don't. However, we can still choose our views to keep us calm, centered and balanced. I have clever friends who live in a very crowded area in the summer. What they do is adjust their window shades in such a way that they see just the trees, and not the crowds on the sidewalk. This act makes them feel less invaded by the crowds. They do not anguish watching the trees, as they do when they are watching the throngs of summer visitors parade by their home. Maybe we all have to adjust our shades, so our views are less invasive and less annoying to us. If you can't change the situation, can you alter the perception? Now look around you. At work could you put a picture of that ocean view/mountain view on your desk? This view of your world will assist you to keep your attitude positive, at least a little. This choice of view, and chosen perception, also works with any social function you must attend. Do you choose to internally obsess about things you cannot change? If you go every year to the same family picnic and the same Cousin/Aunt or Uncle asks you again the same pointed questions: "When are you getting married?" or "When are you getting a divorce?" "How is that new business idea working?" (Which you made the mistake of telling them you had this business idea in the first place.) Even the silliest of "Oh, you cut your hair. I liked it long." Following year, "Oh, you grew your hair! I liked it short." These statements all from the same person. Go figure! After a couple of times of falling into the trap of feeling bad about the said situation, "Why are you not married yet or why didn't you leave him/her yet?" "Why didn't the business work out?" Or the hair thing. Maybe you should expect the question and have an answer ready? Maybe choose a simple response. Smile; say, "Not yet." And add, "Let's eat." Change your view of the day. You already know what will happen. Change your attitude. You'll have a much better time. There will always be people who step over their boundaries to test your faith and patience. These aren't the joy robbers, these are the attitude testers. This type of person is sent to deflate your balloon and send you running for a tooth guard to stop you from gritting your teeth while you're in their presence. Most of these people you know already. If you allow them to test your good attitude, when you know how they are, then this is your problem, not theirs. You cannot control them. We know this. You can only control your reaction or view of them. So, either you change the entire situation, which may not be possible at the moment, or you change your perception or view of it. Keeping you in the best attitude is of paramount importance. Let's do a little detective work here. Are you finding attitude testers around every corner? Look closer. What is the common denominator in the situation? If you are struggling with others, look at the pattern of why things are not falling into place, and see what is the common denominator. The common denominator is usually you. If you start listing what is wrong in your life: work never works out, love does not last, promotions pass you by, and money is always lacking. Just a list of negatives. Look closer. Who is in the center of all these issues? What is the common denominator? Is it you? If work is not working, maybe you need to figure out what it is you would like to do. Do I hear the cry, "Oh, that takes too long." "Oh, I don't have the time." You don't have the time to have one bad day. Are you not going to school to better yourself for the next position? Or would you rather complain? Love life not working? Are you choosing unwisely? Are you wishing to marry and have a committed relationship, but spend time with unavailable partners? Take a day, or a couple of days, and listen to your complaints. Maybe even write them down. Are they valid complaints? Can you change what you complain about? If so, stop complaining. Your time is too precious. Stop wasting it with complaining. Since we have choice with our thoughts, what do we choose? Do I choose, on a fabulous sunny perfect day, to be angry over something or someone I cannot control? I have. What a waste of our very special limited lifetime. I am learning. We choose our internal views. Look closely. Is this you? Do you need to change your view of the situation? Here I would like to add the choice and view of worry. What an attitude drain this is! If you choose to worry about that skin rash, the debt, the marriage, relationship, the children, parents, yourself, what does worry give you? Sleepless nights? Tiresome days? A headache, a stomachache or worse? We all do this at times. We stay in the worry and dread, which is sometimes so much our own learned patterns that when one worry clears up, we fill the space with a new worry. We can choose to face the worry, and make that Dr.'s appointment or book a time with a marriage counselor with or without your spouse. Figure how to handle your debt. What do you need to do for your parents, your children, your welfare? It takes courage to face worry. The challenge of facing worry is life-long. We come to realize once we face the worry, it dims. The situation is handled. We have conquered another of life's many obstacles. Easy? NEVER. Looking at your life full, will make it full. Does this thought, action, desire, emotion serve me, or delete from me? Does this hurt me? Does this heal me? You choose your view. If I am doing things, or having thoughts that hurt me, what is the answer? Stop what hurts you. Simple? Again, NEVER. There are many practices from stress management, to living in the moment, to prayer, to mental skills that will assist you with those internal patterns. If you need additional help with your mental patterns, seek out books, tapes, a therapist, a priest, meditation, whatever it is that will help you be your best. Gather the tools to live your best full life. What bothers you in your view, is not necessarily a problem in someone else's view. It is also best to have a core of friends or associates with whom to share. Usually you'll get some clear direction on how to handle the said situation. "Oh, my work is so terrible, how I cannot find love, I have an issue that plagues me with my family, my spouse, my boss, what is your view on this?" You will get a different view that will assist you with the situation. You can then choose to add their view to yours. It's helpful to talk things out with trusted friends, great parents, a therapist or pets. Sometimes by stepping outside your current situation, things become clearer. The present situation changes for you. You start looking for new work, something happens to that awful boss, you take a job somewhere else and you get promoted. WOW, a new attitude. The choice of having a bad attitude snowballs. There is also a snowball-effect to a great attitude. If you choose to be angry with a chip on your shoulder, the world will treat you this way, and vice versa. More on cause and effect later. Since attitude is our choice, and we can choose our view of the world moment to moment, what do we choose? Why be angry? Why be mad? Why be struggling, unhappy or disappointed? There will always be times, and people, that do make us mad and angry, leading to times of unhappiness and sadness. It is our choice of how long we sit in "it." Does it serve me, or delete from me? How long do you choose to sit in this emotion of anger, madness, etc? Your choice! Your view is always your choice.